Need an amazing holiday recipe to serve at your next dinner? I’ve got you covered! 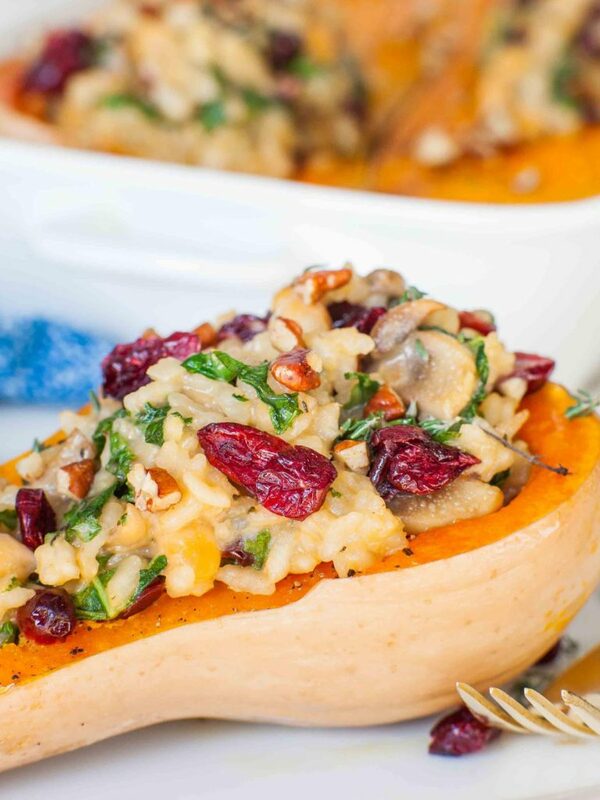 My Stuffed Butternut Squash with White Cooking Wine Mushroom Risotto is aromatic, delicious and looks stunning. 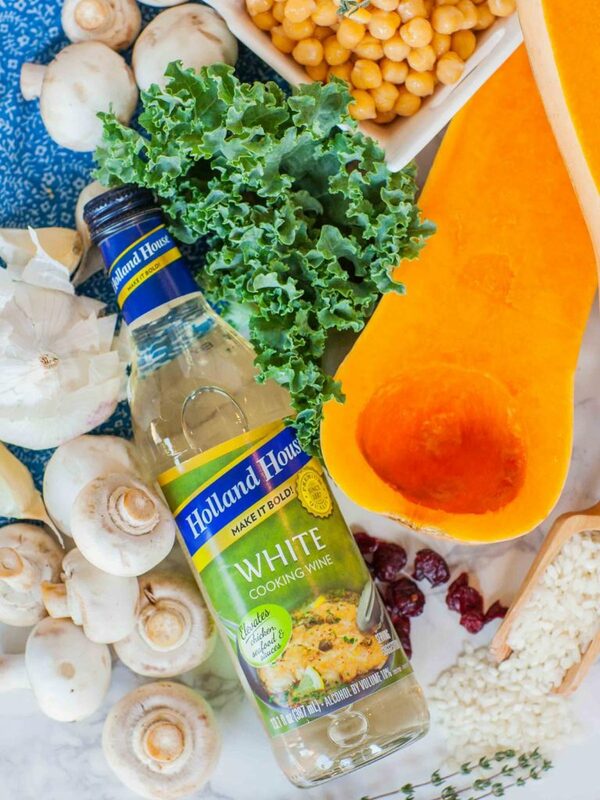 For this incredible recipe, I’ve partnered with Holland House Cooking Wines, a line of flavor-enhancing premium cooking wines, which add a ‘Bold Boost’ of delicious flavor to this festive holiday dish. Watch my video recipe for the step-by-step instructions! I love everything about this easy vegetarian recipe; yes, it’s vegetarian! I start with a classic white cooking wine mushroom risotto using Holland House White Cooking Wine to add delicious flavor. This cooking wine imparts a crisp and light wine flavor that’s perfect for risotto. You can also use this cooking wine when making regular rice, too. Just substitute 1/3 cup of water with the cooking wine next time you’re making rice. You’ll love the flavor! Just keep in mind that Holland House Cooking Wine is seasoned with salt, so adjust the seasoning accordingly. I love making risotto during the holiday season because it’s an elegant rice dish that is the perfect pair to a variety of main dishes and always impresses my guests. To make the filling heartier and holiday appropriate, I like to add cheese, kale, cranberries and chickpeas. All the flavors and textures come together to create an unforgettable dish! The aroma of the filling alone is mouthwatering, but just wait until you add the butternut squash! Butternut is my all-time favorite winter squash. I love the sweet flavor and firm texture, which makes it perfect for stuffing with rice! When making this recipe, go for similar sized squash to ensure even cooking in the oven. Just split the squash open length-wise, scoop out the seeds, season, cover and bake! I love the smell of the squash while it’s baking in the oven; it really complements the equally aromatic risotto filling! This delicious holiday recipe is sponsored by Holland House Cooking Wines, my all-time favorite cooking wines. I always have at least four or five bottles of Holland House in my pantry. It’s one of those staple ingredients that I always keep on hand to add amazing flavor across so many different recipes. For more delicious recipes like this one, make sure to ‘like’ and ‘follow’ the Holland House Cooking Wine Facebook page, and ‘follow’ them on Pinterest! And, visit the Holland House recipe page for even more recipes: HollandHouseFlavors.com. Preheat the oven to 425F. Using a sharp knife, split each butternut squash in half lengthwise. Scoop out the seeds with a spoon and discard. Arrange the squash halves on a large baking sheet, drizzle with olive oil and season lightly with salt and ground black pepper. Cover the squash with foil and bake in preheated oven for 30 minutes, or until fork tender. Meanwhile, prepare the risotto filling. Pour the vegetable broth into a small sauce pot and bring to a simmer. Heat a large sauté pan over medium heat and add the butter. Once the butter is melted, add the diced onion, minced garlic and thyme. Cook the mixture over medium heat, stirring occasionally, for two to three minutes until the onion is translucent but not browned. Add the mushrooms and cook for four to five minutes until the mushrooms are cooked. Add the rice and toss with the butter, mushrooms and onion. Sauté the mixture for two to three minutes, toasting the rice lightly and allowing it to absorb some of the butter. Next, add the Holland House White Cooking Wine. Pour the cooking wine over the rice; whisk and cook over medium heat until the liquid is absorbed. Begin adding the hot vegetable broth, about 1/2 cup at a time, whisking and cooking the rice after each addition. Cook until the liquids are absorbed, then add the next ½ cup of broth. Continue to add the broth slowly until all of it is added and the rice is cooked; this process will take about 30 minutes. Once the rice is cooked, add the parmesan cheese, cranberries, chickpeas and kale. Toss everything together with the rice and remove from the heat. 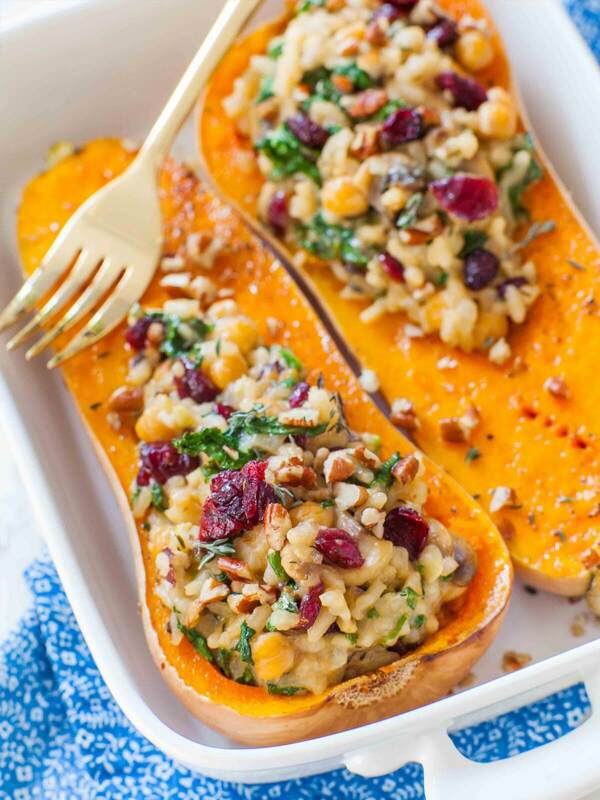 Once the butternut is baked and fork tender, use a spoon to scoop out a larger area for adding the filling. 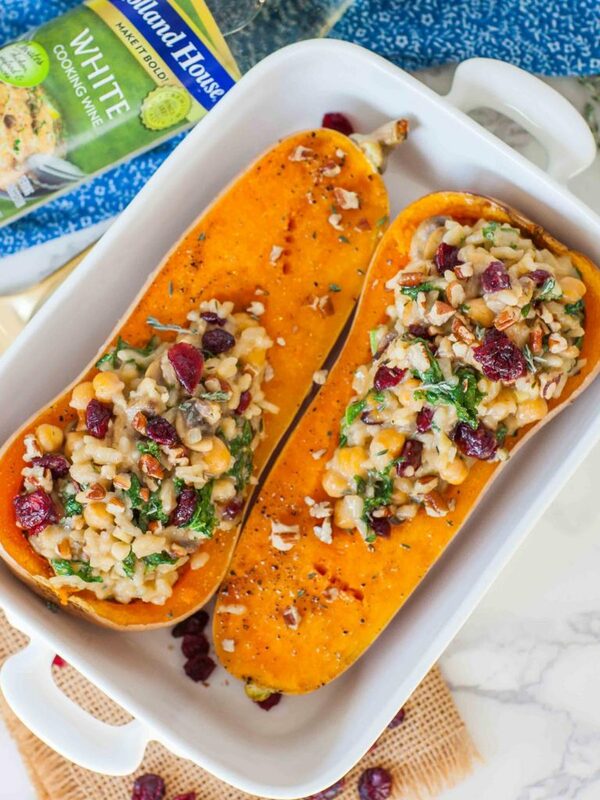 Spoon in a heaping amount of the risotto filling into each squash half, then garnish with chopped pecans and additional cranberries. This looks amazing! I will have to try this vegetarian style! !